Enhance leadership development and performance across the College. Build a culture of inclusion that values diversity of people and ideas, and embraces the meaningful participation of all. Build a common sense of purpose, pride and ownership through open, transparent, multidirectional communication and shared experiences. Ensure a healthy work environment through a values-driven culture. Participation in leadership and professional development programs. Climate surveys measuring the impact of communication, leadership, mentoring and diversity programs. Hiring, promotion and retention statistics for our faculty and staff. Establish a multifaceted collaborative process for the development of a core set leadership skillsets for all members of the CVM Community. Hold a leadership retreat this summer (2019) focused of self-awareness, building skills, capabilities, mindsets and processes to continue leading CVM to become a values-driven organization. Develop a plan for a College-wide Leadership Development 12-month program. Provide multiple platforms and forums for discussing diversity and inclusion issues in a reactive and proactive manner. Continue to provide opportunities to learn and explore diversity and inclusion issues through student club activities (VOICE), Project Safe Ally, Culture Awareness Modules, Basic Race Awareness, Basic Race Awareness Seminars and the National Coalition Building Institute (NCBI) trainings. Continue to build on our diverse community through outreach, recruitment and retention of key faculty, staff and students. Nurture and grow our organization through effective communication which serves as the foundation of our community’s motivation and sense of belonging. Rely on overcommunicating important messages, multiple times within our communication plan and ask for frequent feedback and input from the community. Continue to celebrate our individual and collective successes through our departmental and college communication and marketing resources. Continue to provide opportunities for our community to gather and understand each other which will create a familiarity that feels safe and comforting and provides a sense of belonging. Model our value-driven culture throughout the organization. Using our Values Steering Committee, plan and lead the execution and adoption of the values across CVM with participation from leadership across the college community. Assess, develop, and/or refine programs and processes that support the adoption of a values-driven culture such as: recruiting and onboarding, performance management, communications and faculty/staff/student training. Having effective, strong leaders throughout CVM that drive performance of the college through their leadership is essential. Hold an administrative leadership retreat in early 2018 focused on survey results, action planning, and values development. Holding in various forums across the college to share the results of the November 2017 survey and engage the CVM community in action planning in all four key objective areas. Engaging non-faculty supervisors in NC State’s newly launched Management Essentials program. Intentionally working to build an inclusive community that seeks to ensure people from all different backgrounds and perspectives are actively sought out, valued, connected, and are proud to part of the CVM. 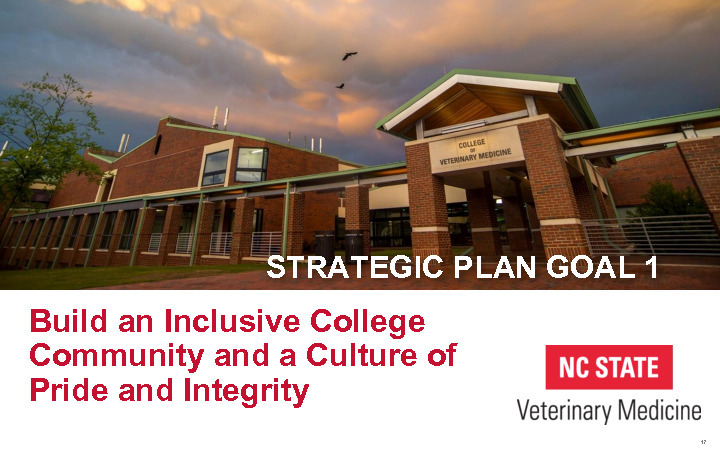 Continue to refine/fulfill the stated goals of the CVM Diversity Strategic Plan. Identify and implement action planning from November 2017 survey. This strategy is about having a shared understanding and alignment around the purpose, mission, and strategic direction of the college. It is also about building strategically aligned execution of plans throughout CVM through effective, open, and transparent communication. Complete, analyze and distribute the results of a college wide climate survey. Identify and implement action planning from the November 2017 survey. 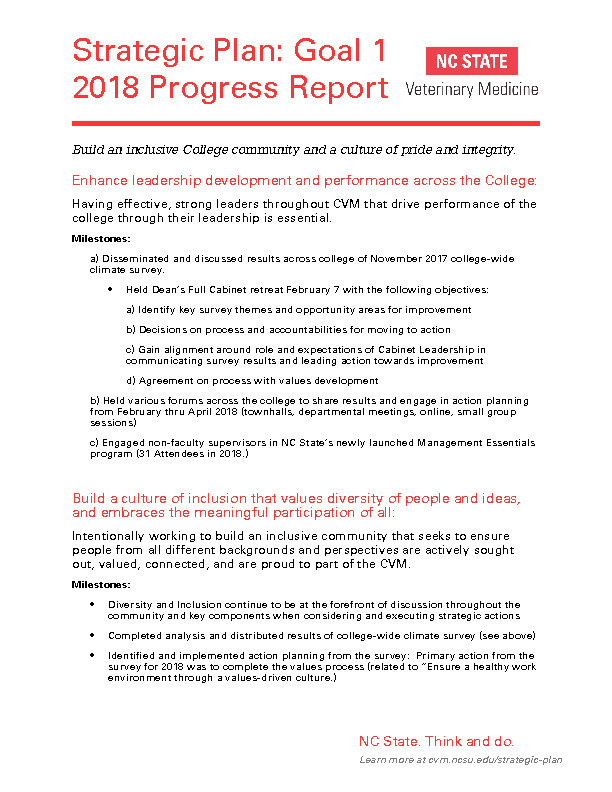 The initial action plan of this strategy is about working to create a values driven college and having clearly defined culture code and values that all understand, can see themselves in and embrace in their day to day lives. Finalize CVM Core Values and Metrics based upon feedback from the 2017 Town Hall and November 2017 survey. Define and explain our core values and establish a plan to engage community in becoming a values driven college.